The author and his test baby (Photo: JR Raphael). If there’s one thing I’ve learned in my first 10 months of being a parent, it’s that you need every advantage you can get. Like most new dads, I learned this the hard way. I think that’s the only way possible — because when it comes down to it, there’s no real instruction manual for these blubbery little bundles we welcome into our lives. (I wish there were, because I’ve spent hours searching and still can’t find the “mute” switch for my 2015 model.) And all the books and blogs in the world couldn’t possibly prepare you for the perpetually damp, noisy, and sleep-deprived reality you’ve signed up for. But hey, it’s 20-frickin’-15. We have virtual assistants that (sometimes) respond to our every demand and $10,000 hoverboards that (kinda-sorta) let you levitate. For Doc’s sake, there’s gotta be some sort of “smart” doohickey that makes raising a baby easier, right? As a tech-obsessed dad, I made it my mission to find out. 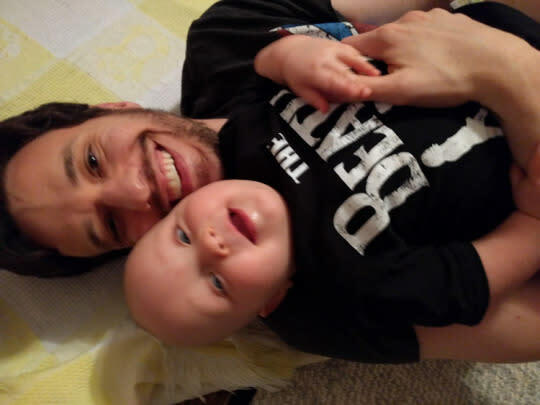 I searched wide and far for the most promising-sounding “smart” baby gadgets around, then went to work testing them on my stunning 10-month-old subject (while my wife bemusingly rolled her eyes and heckled me from the corner of the room). So how’d it all turn out? Snap on your favorite onesie, and let’s find out. The short take: A $169 plastic button that goes on your little one’s jammies at night and sends ongoing data to your Android or iOS device. 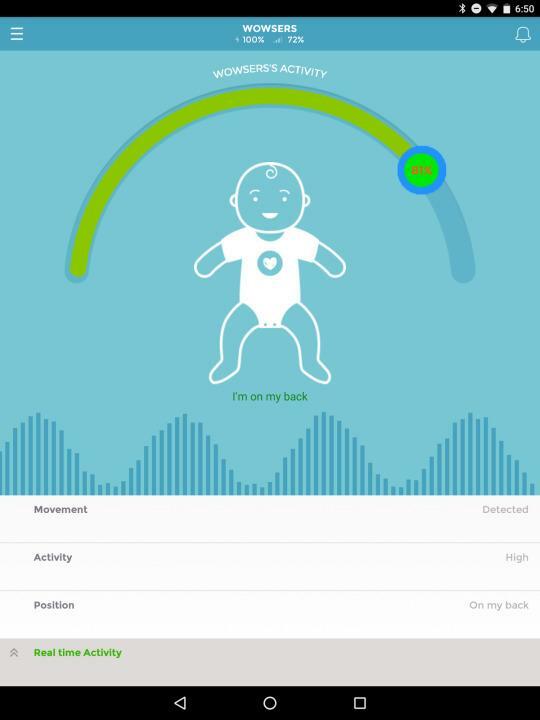 Kind of like a Fitbit for babies, with the added benefit of real-time alerts for things like rollovers, falls, and unauthorized disco dancing (come on — my daughter can’t be the only one…). 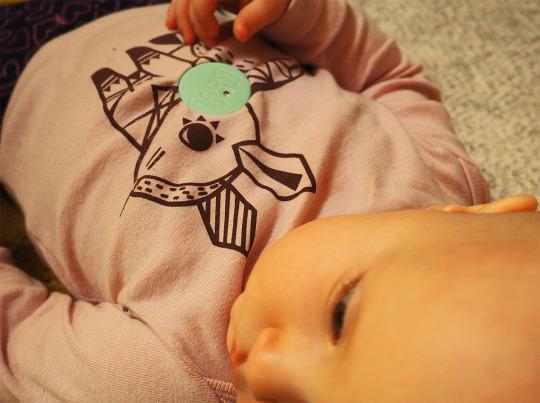 The baby test: Getting the Monbaby onto mon bébé was surprisingly easy — and while the wife and I were initially a little worried about our giggly, wiggly girl plucking the thing off her clothing and plopping it into her mouth, the button proved to be extremely secure and no cause for concern. Equally important, our progeny seemed blissfully unaware of the gadget’s presence on her person (even though it made her look like a miniature version of Iron Man, complete with — no joke — the option for a glowing red light in her core). So off to sleep she went, and off to our living room lair we galloped to covertly observe her activity. Seeing our tyke’s stats on our tablet’s screen was surprisingly satisfying: The Monbaby app showed us whether she was on her back or stomach at any given moment and gave us a sliding-percentage-meter view of her ever-changing activity level (see “unauthorized disco dancing,” above). The alerts all worked as promised, with the tablet screaming for attention every time our buttercup rolled onto her tummy or reached an activity level of 75 percent or higher. The only weird thing about the experience was that the app prompted me to name the device instead of the baby — and since I opted to name it “Wowsers” (again, for what I hope are obvious reasons), the app referred to my daughter as “Wowsers” the entire time. After careful consideration, I’ve determined I’m okay with that. The verdict: The Monbaby Smart Button ain’t cheap — that’s for sure — but it does what it promises, and does it well. It’s simple to set up and easy to use, and its clever design means you don’t have to worry about your baby outgrowing it over time (as is the case with some of our other gadgets, as you’ll see in a second). That being said, I think the product makes the most sense for parents of newborns. Those first six months are when you worry the most about your child’s breathing and the presence of any risk-elevating factors like unexpected belly-flips. Our daughter is old enough now to roll around on her own and sleep in all sorts of weird positions, so the device seems far less critical at this point. In those first six months, though? This definitely could have helped us sleep a little easier (you know, for the hour or two a night that we actually slept). 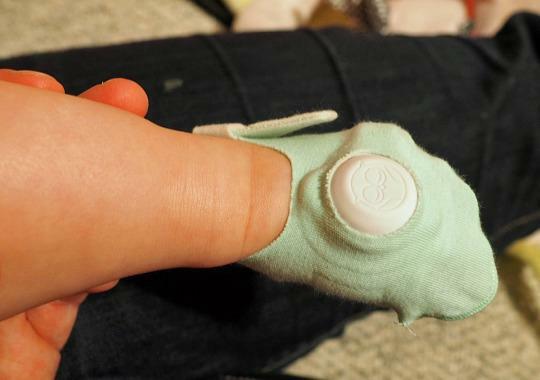 The short take: A $250 sock that uses pulse oximetry to watch your baby’s heart rate and oxygen level and let you know if she stops breathing. It’s the same concept as that little plastic clip thingie they put on your finger in a hospital, with a tiny red light that shines into vessels and measures the amount of oxygen in your blood. What you need to do is set-up an independent 2.4 GHz network with the Wi-fi mode set at 802.11g/b/g for the Owlet to connect to. Once you have that set up run through the wi-fi setup for the Owlet via the add a wi-fi network option in the Owlet app and it should connect. Rather than reprogram my flux capacitor to achieve 1.21 gigawatts of electricity (I think that’s what those instructions said, right? ), I decided to set up a makeshift network with a hotspot from my phone. It wasn’t a great long-term solution, but it worked — and it was good enough for one night. With that hassle behind me, I enlisted my wife’s help to get the special sock onto our girlie’s squirming foot. Once it was on, little Miss Sunshine seemed to forget about it quickly, and we got her to bed. 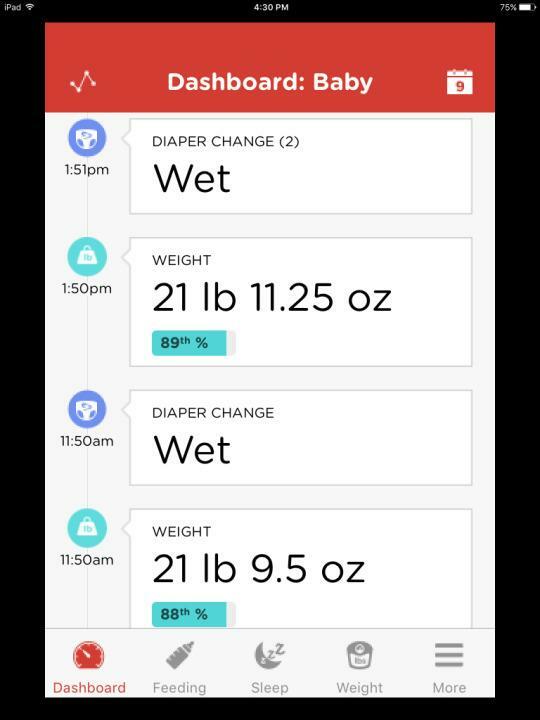 As our angel pretended to sleep, we went to the other room and pulled up the app — on a dusty old iPad we had laying around, since the service amazingly still doesn’t support our preferred platform of Android — and we were immediately able to see that the baby’s readings were all normal. Huzzah! Unfortunately, by this point, our own heart rates were elevated and we both passed out. …if you use an iOS device (an Android version is slated to ship in 2016). …if you have a router and home Internet setup that the Owlet likes. …if you don’t get exhausted and give up while trying to get it to work. I will say that there was something special about watching our daughter’s heart rate gradually slow down as she fell asleep. And especially in those early months, I could see us appreciating the peace of mind that would have come with knowing our baby was breathing normally and that we’d be alerted if anything went awry. Just be sure you’re willing to deal with a hefty price and a lot of potential headaches to gain that sense of serenity. The short take: A special onesie that tracks your baby’s sleeping stats and sends info to your Android or iOS device; starter kit costs $199. Kind of like the last two gadgets, only built into bulky clothing and way more complicated. 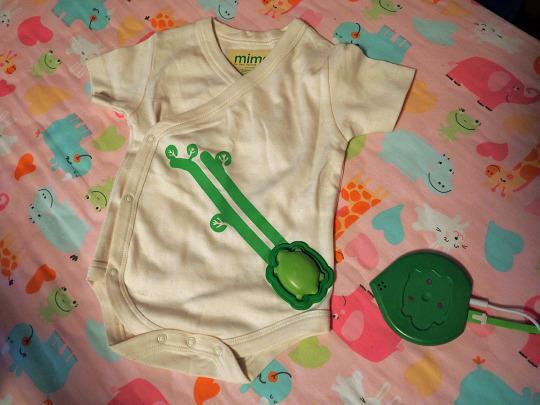 The baby test: Setting up the Mimo was just like setting up any other device: You put a plastic turtle onto a magnetic lily pad, then plug the lily pad into your iPad by way of a 3.5mm audio cable. After that, you attach the turtle to a kimono that wraps around your baby and wait for the turtle to send info to the lily pad so it can be beamed back to your tablet. Okay, so maybe this isn’t actually ordinary at all. In fact, it sounds like something concocted in a peyote-fueled brainstorming session at Burning Man. Sadly, I can’t tell you much more about what the Mimo is like to use — because after having three units sent to me (one of which was preprogrammed by the company specifically to work with my Wi-Fi network) and spending close to an hour consulting with some very friendly reps on the phone and via email, I was never able to get the damn thing to do what it’s supposed to do. Maybe my standard AT&T-provided router is just super finicky (though I tried setting up the Mimo with a hotspot from my phone, too, also without success). Maybe I did something to piss off the plastic turtle community in a past life (though I swear, I like turtles). Or who knows? Maybe I just have really bad luck. But after all that effort, I decided to throw in the turtle — I mean, the towel — and move on. Heck, a normal consumer wouldn’t have made it half this far before sending the product back for a refund. The verdict: Configuration convolution aside, I’ll say this: Even if it had worked as intended, the Mimo seems unnecessarily complicated and costly for what it does. The device is supposed to monitor things like your baby’s breathing, body position, and activity level — in other words, the same sorts of factors the two previous products also measured. Maybe I’m missing something, but I just can’t see the argument for buying this over the other similar options. The short take: A wearable patch that sticks to your baby’s skin and sends ongoing temperature data to your mobile device, including alerts if the fever reaches a specified level. Cost: $25 for a set of 3. 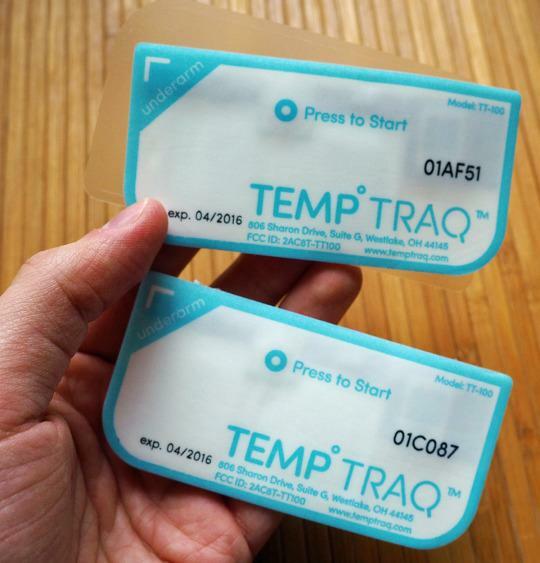 The baby test: I’ll get right to it: My adventure with TempTraq did not go well. My usually-sweet subject did not like having the patch attached under her arm, where it’s supposed to go. And even when I managed to get it there, it never stuck for long. Plus, the temperature readings remained accurate only when the baby had her arm down flat against her side – which she rarely does (disco dancing, remember?). The rest of the time, the readings fluctuated wildly and were nowhere near realistic. Each patch also works for only 24 hours once activated – so if you fire one up and then fail to get it stuck to your chickadee, that’s eight bucks down the diaper bin. The verdict: The TempTraq is a good idea with a bad implementation. It’s expensive, difficult, and unpredictable – just like my daughter (but at least she’s cute). The short take: A changing pad that tracks data about your baby and sends it to your mobile device; $299 ($199 if pre-ordered in December). The baby test: The wife and I quickly connected Hatch Baby’s changing pad to our iPad, then put our homunculus atop the surface and got to work doing — well, you know. The unspeakable things we parents do in such situations. While the pad didn’t make the process itself any more palatable, it did add some genuinely helpful tools into the mix. 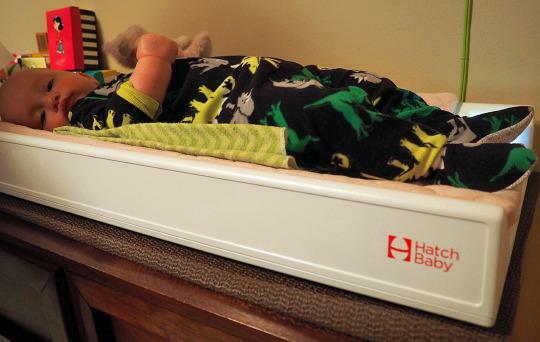 Most significantly, the Hatch Baby can take your baby’s weight while you’re doing the dirty work — and even log it before and after a feeding, so you can track not only your dumpling’s growth over time but also how much milk she’s actually ingesting with each suckling session. You get all the stats, including comparisons via percentile rankings, in an easy-to-follow dashboard on your Android or iOS device. As parents who struggled with feeding issues during our daughter’s early months — and didn’t realize until a shocking four-month checkup that she wasn’t getting enough nutrients and was losing weight instead of gaining it — this type of simple self-checking tool could have been invaluable for us. The Hatch Baby can also help you track areas like diaper changes and feeding durations, which are factors we always logged with great care in those worry-filled first few months. 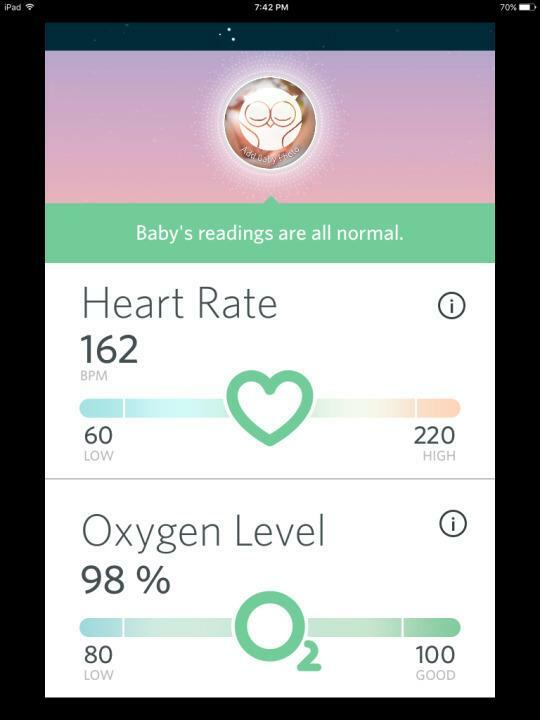 It compiles all that data in the app and lets you know how your baby compares with others at the same age so you can see right away if something’s amiss. The verdict: Of all the gadgets I tested, this is the one I could most see fitting into our lives and providing real ongoing value. It’s easy and almost even fun to use (which, let’s be honest, is saying a lot for a diaper-changing apparatus), and it could have saved us massive amounts of time, headaches, and scary moments at the pediatrician’s office over these past several months. My wife informs me this is without a doubt the gadget of the group she’d want to purchase — and as we all know, her vote is the one that counts. When not on diaper duty, JR Raphael writes about smartphones and other titillating technology. Come say hi on Twitter or Google+ (don’t worry — he just washed his hands).